A lighting salesman in North Phoenix has created a massive robot wine rack and put it up for sale on Craigslist. The US$7,000 device securely holds 32 bottles of wine, weighs 1,000 pounds, and features an array of mock armaments. The giant robot has been positioned in a standing pose and the right arm is pointed forward as if the robot is about to fire a wine bottle. 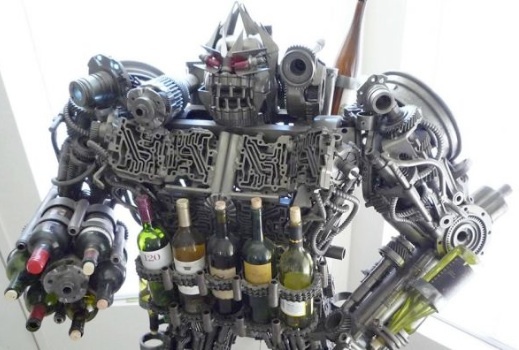 Within that right arm gun design, the owner of the robot can house up to six bottles of wine. An additional 26 bottles of wine can be placed around the robot frame including spots around the torso as well as on the two legs – making the wine bottles look like extra ammunition. It was built with used transmission parts from various motorcycles and cars. All the parts were treated in a chemical solution so that the robot is safe to display within a household. In addition, all parts were painted a “gun metal grey” colour as well as receiving a protective clear coat after the paint was dry. Blue LED lights have been wired along sections of the robotic frame including the leg, torso and top of the right shoulder.